Took a look at what’s happening in the back of the store, at the espresso bar area. I love it. 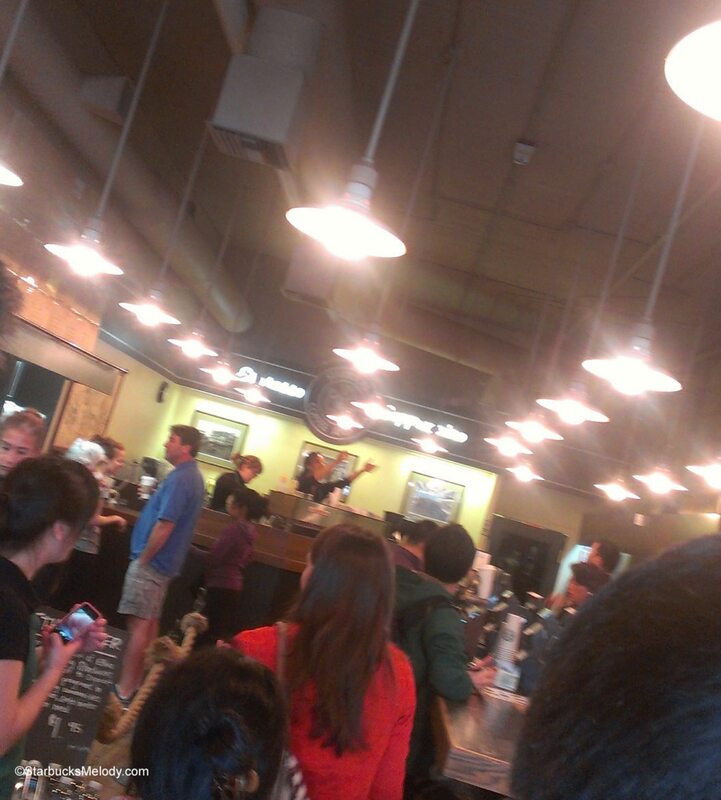 In the background of the photo, you see barista Maya at the espresso machine with her arms high in the air. She is catching cups! You have to be good at the game of catch to work at this store! In this store, it IS part of the routine that the register barista throws the cups to the bar barista who must catch them! I can imagine that would be a little nerve-wracking. I previously posted this on the StarbucksMelody.com Facebook page, and I saw this comment in one of the shares: “What do you think? How can we incorporate “cup throwing” into our BR2 training?” I laughed out loud when I read that. Yesterday, when I looked at my phone and realized I had caught a lovely moment of cup throwing at 1912 Pike Place Starbucks, I smiled from ear to ear! Hope you liked this little snippet of 1912 Pike Place too. Reminds me of the folks at the fish store in pike place market that do the impressive fish throwing for customers and tourists! @purple1 – I can totally see that! Love earning free bags of coffee. Their k cups are still too expensive in my opinion but I will be in to grab some Komodo Dragon to replenish my stock. This is just…cool. Love your blog and love this pic.